Rhode's ancient and medieval monuments tell the story of an island prized by all. Rhodes is one of the most enchanting Greek destinations that visitors today can select. On this singular island, one comes face to face with Greece’s more recent past, where the most appropriate start to every “story” told by a medieval tower, a soaring minaret, a crenellated wall or an arched gateway marked with a heraldic emblem seems to be “Once upon a time in Rhodes…” Not every architectural or archaeological trace reveals a perfect, fairytale existence, but these contrasts make our understanding even more realistic. All around are signs of the Rhodians’ struggles with war, their need for constant vigilance and the relentless passage of time. Simultaneously, strength, prosperity, elegant foreign influence and far-reaching Rhodian authority are also evident. This is a strategically located, resource-rich island whose landscape and urban architecture remain criss-crossed with the vestiges of multiple cultures – from trade-bent Minoans and Mycenaeans in the Bronze Age, through despotic Persians in the Classical era, to the covetous empires of the Romans, Byzantines, Crusaders, Ottomans and even modern-day, pre-WWII Italians. Rhodes was not always subject to outside powers, however: after freeing itself from the grip of Athens, which had dominated the Aegean in the 5th c. BC, and prior to the encroachment of the Romans, Rhodes reached an extraordinary zenith during Hellenistic times (4th-2nd c. BC). It became an autonomous maritime giant that essentially ruled the seas in the Eastern Mediterranean through its enormous fleet of merchant ships and widely respected code of maritime laws. Everywhere one looks, whether at the fortified port of Rhodes Town or among the age-old settlements, castles and watchtowers that ring the coasts, Rhodes’ timeless relationship with the sea is clear. Naturally, as an island, Rhodes was first occupied by seafarers: Neolithic travelers of the 6th millennium BC, who brought with them, or acquired locally through seaborne trade, volcanic obsidian and other foreign goods from neighboring islands or mainland areas both near and far. 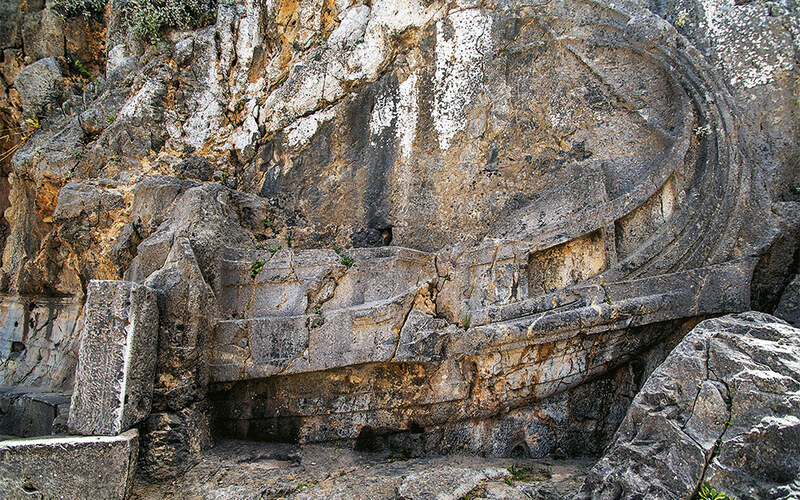 Typical of Rhodes’ Stone-Age sites are the rock shelters of the northeastern Kalythies region, including Erimokastro Cave, where archaeologists uncovered the fossilized bones of dwarf elephants. Aghios Georgios Cave (5300 BC-4000/3700 BC) contained bone or chipped-stone tools and stone grinders used for harvesting and processing cereals, meat and other foodstuffs. Also found were mollusc shells; the bones of fish, wild fauna (deer, hares, foxes, birds) and domesticated animals (sheep, goats, cattle, pigs); ceramic bowls; and spindle whorls for weaving. Altogether, it seems the earliest Rhodians were farmers, fishermen, hunters and craftsmen who migrated around the island depending on the season and availability of food resources. From earliest times, people settled mostly in northern Rhodes and along its eastern shores – a general pattern that continued throughout the island’s history. The first proto-urban settlement was Asomatos (2400/2300 BC-2050/1950 BC), a northwestern, Early Bronze Age coastal site, where small and large buildings, some with hearths and storage rooms, covered an area of only about 100 square meters. During the Late Bronze Age, as Minoan and Mycenaean immigrants arrived, larger towns, referenced in Homer’s Iliad, arose at Ialysos (modern Trianda), Kamiros and Lindos, which went on to become the settings for the great Dorian-founded cities of Archaic, Classical and Hellenistic Rhodes. 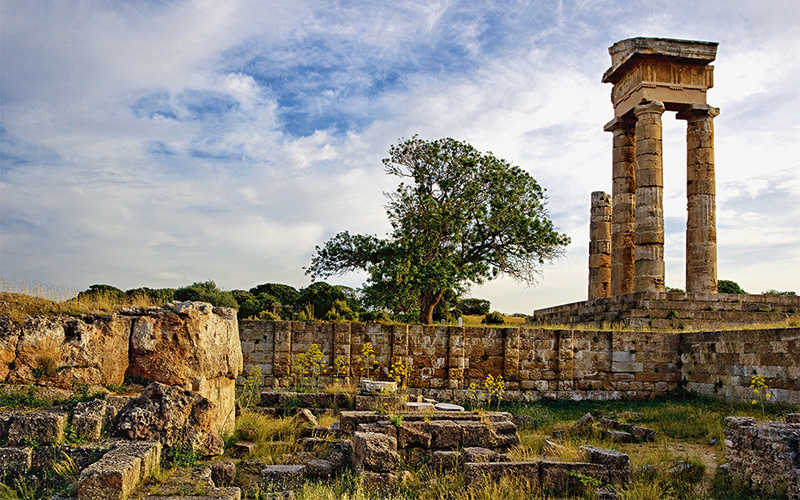 In 408 BC, the three principal communities joined forces to create a new city-state at Rhodes Town, which, some 2,500 years later, still remains the capital and nerve center of the island. 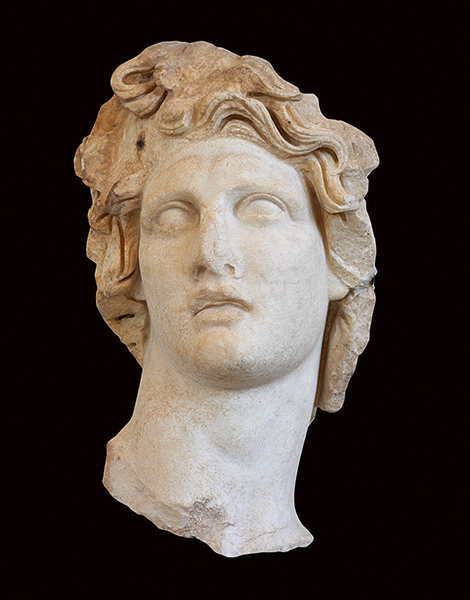 Marble head of Helios, the Sun God, the Rhodians’ main deity. A representative work of the Rhodian Baroque style, it is particularly noteworthy for its expressiveness (2nd c. BC, Archaeological Museum of Rhodes). The Laocoön Group, a marvelous work of Rhodian sculpture (1st c. BC-1st c. AD), which greatly influenced Michelangelo and other Renaissance sculptors. Created by three Rhodian artists, Agesander, Polydorus, and Athenodorus. The original stands in the Vatican (Pio Clementino Museum); a plaster cast is displayed in the Palace of the Grand Master in Rhodes. Mythologically, Rhodes was said to have emerged from the sea as a gift from Zeus to Helios, god of the sun, whose wife, Rhodos, daughter of Poseidon, bore him seven sons. 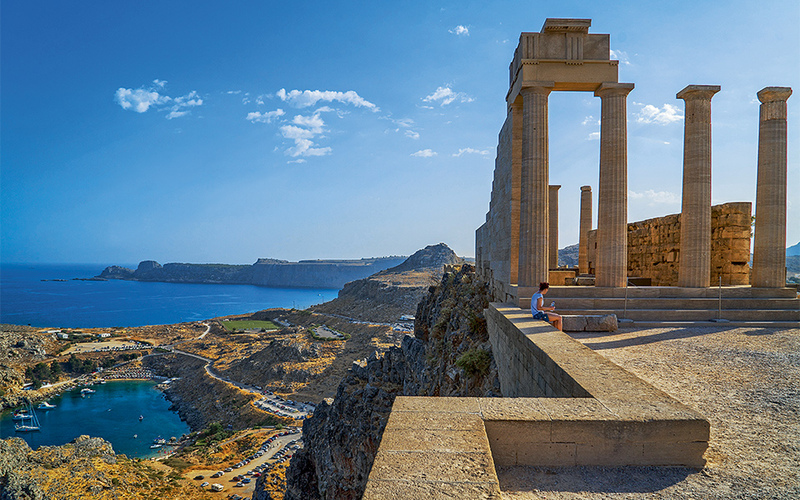 Three of Helios’ grandsons, Ialysos, Kamiros and Lindos, were the eponymous heroes of the island’s main cities. Moreover, the Telchines, semi-divine inventors of smithing, kept a workshop on Rhodes, a place praised by Pindar and widely known for its supreme artistry, especially in the sculpting of bronzes – epitomized by the legendary Colossus of Rhodes. 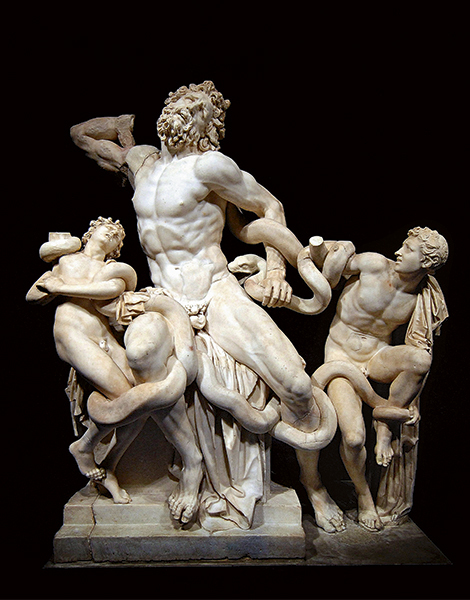 Pliny attributed the famous marble statue “Laocoön and His Sons” to the Rhodian artists Agesander, Polydorus, and Athenodorus. The Winged Victory (Nike) of Samothrace may also have been produced by this trio, or by Pythokritos of Lindos. Rhodes was equally famed as a center of philosophy, rhetoric and literature. Prominent philosophers and rhetors who either originated from or frequented the island included Eudemos (Rhodes); Aeschines (Athens); Panaitos (Lindos); Posidonius, Apollonius Malakos and Molon (Asia Minor). Among the well-known students attending here were Julius Caesar and Cicero. Today, the survival and usual arrangement of Aristotle’s works are largely credited to Andronicus of Rhodes (1st c. BC). Cleobuline of Lindos (ca. 550 BC) is remembered as a philosopher, poetess and writer of riddles; Apollonius Rhodius penned the epic poem Argonautica; and Posidonius, the Stoic-turned-Peripatetic philosopher and one of antiquity’s greatest thinkers, also researched, taught and wrote about physics, geography, history and many other subjects. The walled medieval Old Town is truly an impressive sight. Visitors should allow plenty of time to explore its broad avenues and narrow, labyrinthine alleys. 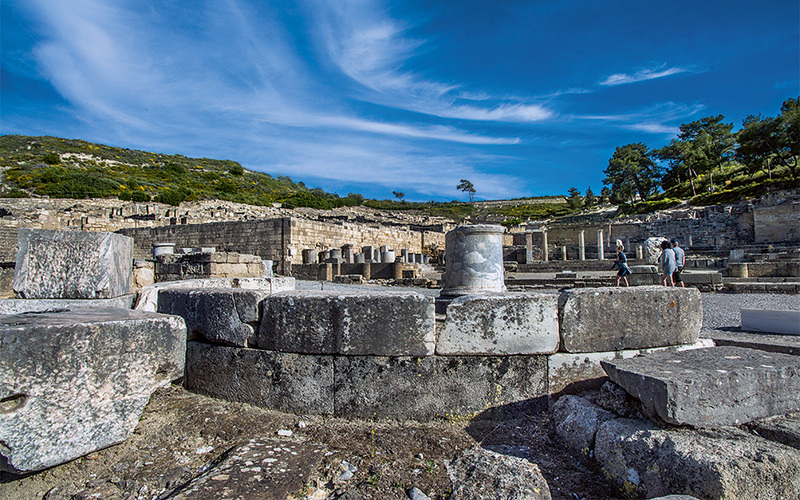 From an ancient archaeological perspective, there are few visible in-situ remains to take in, apart from the foundations of a temple of Aphrodite (3rd c. BC), just inside the Liberty Gate, and occasional remnants of the city’s Byzantine fortifications. In its heyday, Rhodes also possessed sanctuaries of Demeter, Artemis, Asclepius, Dionysus and other deities. A star attraction is the Archaeological Museum. From the moment you enter the courtyard of this 15th c. building – constructed by the Knights of St. John as their Hospital – you’re in another world, passing beneath vaulted ceilings, climbing stone staircases and perusing a vast arrangement of artifacts presented in numerous chambers. Here one can see the discoveries of Italian and Greek excavations at Ialysos, Kamiros, Lindos, Rhodes Town and smaller sites: pottery, jewelry, sculpture and figurines compete for your attention with grave steles and floor mosaics depicting lively mythological figures, such as Eros on a dolphin or Bellerophon riding Pegasus about to strike Chimera. Ruins at the archaeological site of Kamiros, one of the three city-states founded by the Dorian settlers of Rhodes. The people of Kamiros lived and prospered through agricultural production. These latter exhibits are found in a cool, shady courtyard adorned with sculptural and architectural fragments, a tranquil fishpond and two gurgling water fountains. Adjoining this pleasant refuge are the excellent new Prehistoric Gallery, the informative Epigraphical Collection and a reconstructed 18th/19th c. Ottoman residence – all located within the former 15th c. Villaragut Mansion (now part of the museum). Small displays of ancient artifacts and a superb series of colorful Roman mosaics – brought to Rhodes from Kos by the Italians – can also be seen in the restored Palace of the Grand Master. West of the walled city, the ancient acropolis on Monte Smith – an enormous, mostly unexcavated archaeological preserve of some 12,000 sq.m. – is well worth a visit. There, in addition to panoramic views, one finds monuments of the 3rd and 2nd c. BC, including a restored stadium, formerly flanked by a gymnasium and library; a reconstructed odeon; and the Doric Temple of Apollo Pythios, partly re-erected by the Italians prior to 1943, but now encased in decaying scaffolding. In two spots to the north are large column drums and entablature blocks marking the site of the Doric Temple of Athena Polias and Zeus Polieus, protectors of the city, and an intriguing subterranean complex of interconnecting rooms carved in the bedrock (the “Nymphaia”), where ancient Rhodians worshiped. In honor of Helios, after 408 BC their principle deity, the people of Rhodes also staged a festival every four years, the Halieia, which included athletic contests in the stadium. Excavations have revealed that the Hellenistic city developed on a gridded Hippodamean plan. The ancient odeon on the hill of Monte Smith (2nd c. BC). It held about 800 people and is believed to have served as both a venue for musical events and as a place of exposition and teaching for the famous orators of Rhodes. The complex of sites that composes ancient Ialysos, whose Late Bronze Age settlement was one of the most important centers in the Dodecanese, now lies largely obscured amid modern development. Rising above the coastal plain, however, stands Ialysos’ ancient acropolis on Mt Filerimos, the view from which is unsurpassed. A winding road ascends to its summit, occupied by a Doric-facaded fountain-house (4th c. BC); an amphiprostyle Doric Temple of Athena (3rd/2nd c. BC); the ruins of an Early Christian church (5th/6th c. AD) and a Byzantine monastery chapel (10th/11th c.); a Byzantine fortress (11th c.); the small medieval Chapel of Aghios Georgios Chostos; and a reconstructed monastery of the Knights Hospitaller (14th c.), whose Gothic church has a distinctive bell tower. Long a target of archaeological interest, Ialysos was first explored in 1868-1871 by Sir Alfred Biliotti, Britain’s vice-consul, who unearthed tombs on the hill of Moschou Vounara containing pottery and jewelry – the first known Mycenaean collection in the world, preceding even Heinrich Schliemann’s discoveries at Mycenae (1876). Subsequent early 20th-century investigations by Italian and, more recently, by Greek scholars (since 1978) have shown the Ialysos area was occupied from the Middle Bronze Age through at least Classical times. Mt Filerimos served as a peak sanctuary, before its reoccupation in the Proto-Geometric era (from ca. 1050 BC), while settlements and cemeteries were established in its shadow. The large Late Bronze Age town, comparable to Akrotiri on Santorini, flourished ca. 1600 BC-ca. 1300 BC, serving first the Minoans, then the Mycenaeans as a major trade station and maritime gateway between the Aegean and the East. Adjacent Archaic-Classical Ialysos was home to the famous Olympic boxer Diagoras of Rhodes. The extensive ruins of Kamiros, southwest of Ialysos, occupy a hillside overlooking the sea and the mountains of nearby Asia Minor. Although most of the remains in this grid-planned city date from Hellenistic-Roman times, with some Early Christian presence, finds of Late Bronze Age and Geometric date reveal the site was first occupied in the 14th c. BC, then resettled in the 9th c. BC, as a hilltop shrine to Athena Kameiras. The town thrived in the 7th-6th c. BC, experienced a period of rebuilding after an earthquake in 226 BC, then gradually declined, abetted by another quake in 142 BC. Kamiros was known for its epic poet Peisander (ca. 648 BC), who first described Heracles wearing a lion’s skin, and as the first Rhodian city to mint its own coins (6th c. BC). Excavations by Biliotti (1852-1864) and the Italians (from 1928) exposed three main districts: the agora, with a temple of Pythian Apollo (3rd c. BC), two sanctuaries and two public baths; a rising residential zone of densely packed courtyard houses reminiscent of those in Delos, separated by narrow side streets and a broad central avenue; and the triple-terraced acropolis, adorned with an unusually long (204m) Doric stoa (colonnaded, covered walkway or visitors’ hostel; 3rd c. BC) and a Doric temple of Athena (3rd c. BC) installed on top of a previous Classical one. Beneath the stoa, an enormous Archaic-era reservoir was discovered that originally held 600 cubic meters of water, enough for several hundred households. The Doric Temple of Athena, constructed ca. 300 BC on the highest point of the acropolis of Lindos, in place of an earlier temple. The acropolis of Lindos, perhaps the most picturesque place in Rhodes, juts up from the sea, flanked by two natural harbors. The surrounding region was inhabited from earliest times, although archaeological evidence on the acropolis itself has so far only attested to use beginning in the 9th c. BC. Local worship of Athena Lindia led to the promontory’s development into a formal sanctuary, with a 6th c. BC amphiprostyle Doric temple, later rebuilt ca. 300 BC. A monumental entranceway (propylon), installed around the same time, followed by an elegant Doric stoa, also adorned the site, while a theater with twenty-six tiers of seats can be seen carved into the hill’s western slope. At the foot of the steep Hellenistic staircase accessing the citadel gate, a relief sculpted on the face of the vertical rock by the renowned Pythokritos (early 2nd c. BC) depicts an ancient triimiolia and recalls the Lindians’ former maritime might. Roman remains on the acropolis include the Ionic Stoa of Psythiros (2nd c. AD) and a Diocletian-era temple (late 3rd c. AD). Lindos’ military defenses date from at least the Hellenistic era, but were augmented first by the Byzantines and then by the Knights Hospitaller, who strengthened the castle on the rock with crenellated walls and four large towers (14th c.). Caves, elaborate family tombs and other sites around the acropolis were reused for numerous Early Christian and Byzantine churches. Excavations at Lindos were initially conducted by Danish archaeologists (1902-1905), which the Italians continued prior to WWII, along with extensive restorations. Less ambitious but more accurate restorations have more recently been carried out by Greek cultural authorities (1985-2008). 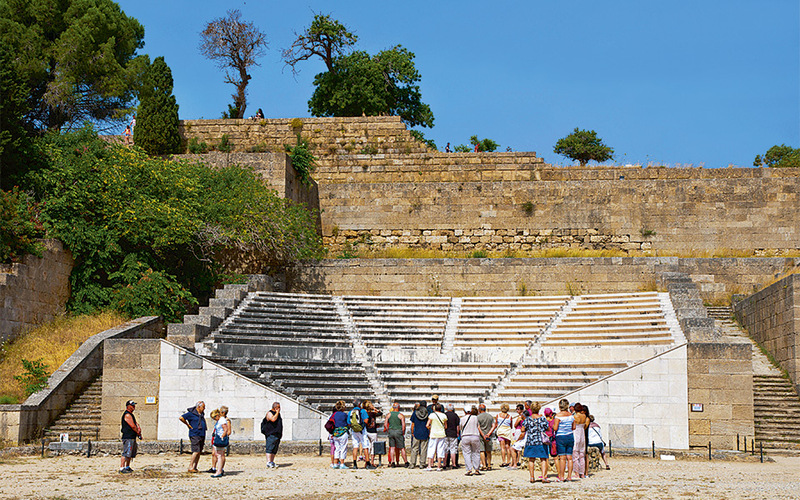 Although many visitors choose to concentrate on Rhodes’ main historical sites, a tour around the island’s coast, taking in the enormous array of other significant scenic remains, is well worth consideration. Most evocative are the ruined castles, usually perched on precipitous crags, including those of Kritinia, Monolithos, Asklipio and Farakleos. The Rhodian countryside is diverse and impressive, with historic spots lying around every bend, often signposted with intriguing labels such as the “Old Silk Factory” east of Kattavia. The southern end of the island is another world: open, relatively quiet and featuring one of the largest sand beaches imaginable, connecting Prasonisi Islet to the Rhodian mainland. Just beside it, the fortified settlement of Vroulia (7th-6th c. BC), made visitor-friendly with EU funding, lies near-forgotten, awaiting further governmental support before opening to the public. On the east coast, the mountaintop 16th c. monastery of Tsampika, with its panoramic view of the Rhodian sea, is also well worth the trip.